Figure A. RPE conjugated Mouse anti Human CD19 (MCA1940PE) and Alexa Fluor 488 conjugated Mouse IgG1 isotype control (MCA928A488). Figure B. RPE conjugated Mouse anti Human CD19 (MCA1940PE) and Alexa Fluor 488 conjugated Mouse anti Human CD79a (MCA2538A488). All experiments performed on red cell lysed human blood gated on lymphocytes in the presence of Human Seroblock (BUF070A). Data acquired on the ZE5™ cell analyzer. Mouse anti Human CD79a antibody, clone HM57 recognizes an epitope within the cytoplasmic domain of CD79a. 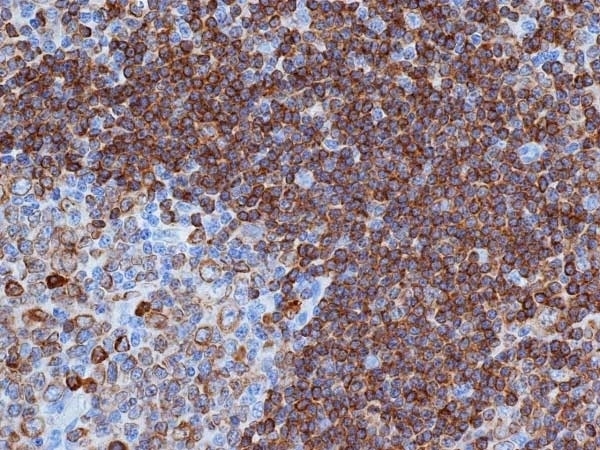 CD79a, also known as mb-1, is a 45 kDa protein that is expressed by B lymphocytes during differentiation from early pre-B cell stage through to plasma cells. The CD79a molecule associates with CD79b (B29) to form a heterodimer that is non-covalently linked to surface immunoglobulin, forming the B-cell receptor (BCR) complex. 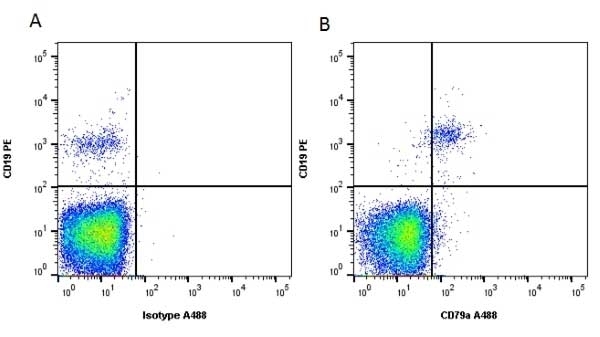 The CD79a/CD79b heterodimers are also necessary for intracellular signaling following antigen-binding to surface immunoglobulin. 2This product requires antigen retrieval using heat treatment prior to staining of paraffin sections. Sodium citrate buffer pH 6.0 is recommended for this purpose. Mason, D.Y. et al. (1991) The IgM-associated protein mb-1 as a marker of normal and neoplastic B cells. J Immunol. 147 (11): 2474-82. J Histochem Cytochem. 46: 1443-54. Spaas, J.H. et al. (2013) Culture and characterisation of equine peripheral blood mesenchymal stromal cells. Vet J. 195 (1): 107-13. Nelson, D.D. et al. (2010) CD8(+)/perforin(+)/WC1(-) gammadelta T cells, not CD8(+) alphabeta T cells, infiltrate vasculitis lesions of American bison (Bison bison) with experimental sheep-associated malignant catarrhal fever. Vet Immunol Immunopathol. 136: 284-91. Cytometry A. 81 (4): 312-23. Long, H. et al. (2016) Polyostotic Lymphoma in a Ferret (Mustela putorius furo). J Comp Pathol. 154 (4): 341-4. Schinköthe J >et al. (2016) Characterization of tuberculous granulomas in different stages of progression and associated tertiary lymphoid tissue in goats experimentally infected with Mycobacterium avium subsp. hominissuis. Comp Immunol Microbiol Infect Dis. 47: 41-51. Bozkurt, Y.A., et al. (2014) Histological and immunohistological studies of the structure of lymph nodes in Kilis goats. Froment R & Bédard C (2016) Marked hyperphosphatasemia associated with an acute leukemia in a Great Dane. Aresu, L. et al. (2015) Canine indolent and aggressive lymphoma: clinical spectrum with histologic correlation. Vet Comp Oncol. 13 (4): 348-62. Poggi, A. et al. (2015) Flow cytometric evaluation of ki67 for the determination of malignancy grade in canine lymphoma. Vet Comp Oncol. 13 (4): 475-80. Gelain ME et al. (2014) CD44 in canine leukemia: analysis of mRNA and protein expression in peripheral blood. Vet Immunol Immunopathol. 159 (1-2): 91-6. Paebst, F. et al. (2014) Comparative immunophenotyping of equine multipotent mesenchymal stromal cells: an approach toward a standardized definition. Cytometry A. 85 (8): 678-87. De Schauwer, C. et al. (2014) Characterization and profiling of immunomodulatory genes of equine mesenchymal stromal cells from non-invasive sources. Stem Cell Res Ther. 5 (1): 6. Claessen, C. et al. (2015) Equid herpesvirus 1 (EHV1) infection of equine mesenchymal stem cells induces a pUL56-dependent downregulation of select cell surface markers. Vet Microbiol. 176 (1-2): 32-9. Novacco, M. et al. (2015) Prognostic factors in canine acute leukaemias: a retrospective study. Hillmann, A. et al. (2016) Comparative Characterization of Human and Equine Mesenchymal Stromal Cells: A Basis for Translational Studies in the Equine Model. Cell Transplant. 25 (1): 109-24. Moore, P.F. et al. (2013) Canine inflamed nonepitheliotropic cutaneous T-cell lymphoma: a diagnostic conundrum. Vet Dermatol. 24 (1): 204-11.e44-5. Nagata, K. et al. (2017) Epstein-Barr Virus Lytic Reactivation Activates B Cells Polyclonally and Induces Activation-Induced Cytidine Deaminase Expression: A Mechanism Underlying Autoimmunity and Its Contribution to Graves' Disease. Wessels, M. et al. (2017) Systemic necrotizing polyarteritis in three weaned lambs from one flock. Uitterdijk, A. et al. (2017) Time course of VCAM-1 expression in reperfused myocardial infarction in swine and its relation to retention of intracoronary administered bone marrow-derived mononuclear cells. PLoS One. 12 (6): e0178779.